Telescope Casual Furniture provides the ultimate in style and luxury. Their sling chairs are made from powder coated aluminum, which makes them light weight and very durable against the elements. Most styles are designed for stacking, a major plus when the time comes to stow it away for the season. The Gardenella Collection has long been a Telescope staple, over the years it's been a favorite of ours to! Telescope's Fabrics, you can choose from a variety of colors and patterns, enough to satisfy any color scheme. The Sunbrella material is made from Arcylic not cotton, giving 100% shade protection and sustainability. There are also a number of frame finishes available such as, Gloss White, Ivory, Forest Green, and Bronze just to name a few. Telescope's collections consists of sling and cushion sets, wood, aluminum, and marine grade vinyl as well as, cast and wicker. We are an Authorized Telescope Representative. Pool 'N' Patio provides in-house furniture services - we can fix broken umbrella cords and "re-do" old Telescope sling and strap furniture, all at a fraction of the costs. Or when you need those special "feet" for your chairs, we can get it for you! Telescope Casual Furniture has always been an American company, (The factory is located in Granville, NY.) 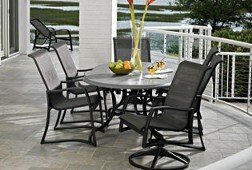 Since 1903, they have been a leader and known through out the industry for their fine quality outdoor furniture. Thank you for visiting, we look forward to serving you in the future!